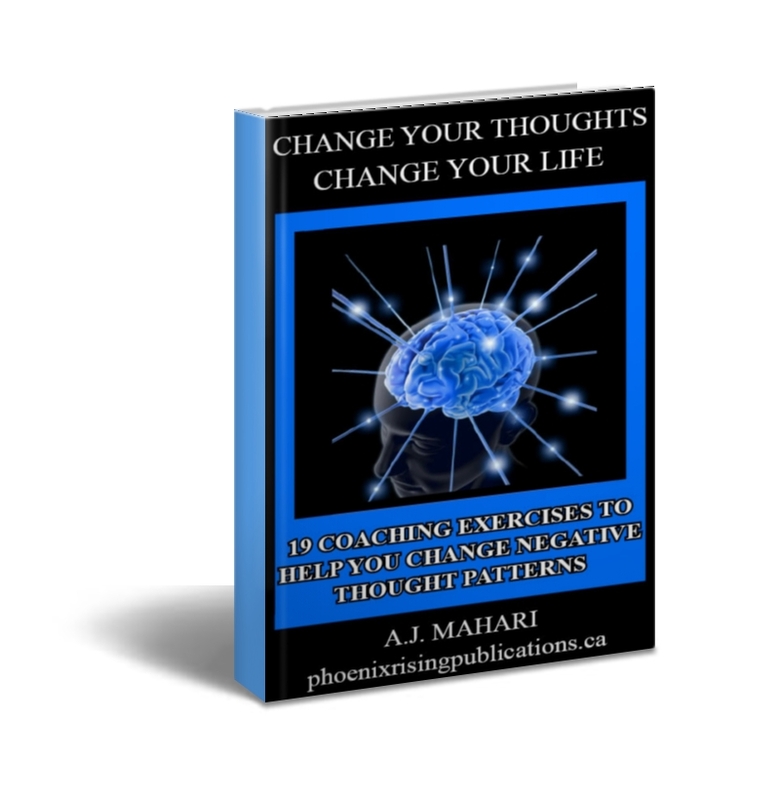 Change Your Thoughts - Change Your Life Ebook â€“ 19 Coaching Exercises To Help You Change Negative Thought Patterns by Life Coach and BPD Coach, A.J. Mahari, is a 102 page Ebook chalk full of information and 19 coaching exercises to help you change negative thinking into positive thinking. This Ebook stresses how much you will benefit from focusing postively on the here-and-now so that the decisions you are making today will help you create a positive, successful and productive future. And this Ebook doesnâ€™t just tell you that, it provides you with practical exercises that will show you how to create positive change and how to not only stop focusing on the negative, stop worrying, but also stop feeling so stressed and stop ruminating on intrusive, negative, and unwanted thoughts. Not everyone can afford Life Coaching. This Ebook gives you exercises to do that I use with many of my clients and now you too can get this help and at a fraction of the price. Determination and belief are the starting points for the shift from negative thought patterns to positive thoughts that create success. Learning to lay down defenses and open your mind to new, positive, thoughts can and will help you create needed and wanted change. Determination and belief will open you to new opportunities to get to know who you really are and/or more about who you authentically are. Thoughts are energy. Your energy effects all areas of your life. You can quickly and easily learn how to plant the seeds of positive thoughts and positive energy in your life. How can you do this? This Ebook is based on exercises that will help you to realize real answers that will help you shift your thoughts and energy from negative to positive by getting you in touch with questions that will teach you more about yourself, what you want and how to get what you want â€“ what your goals are and how to achieve those goals. Change Your Thoughts - Change Your Life, will walk you through 19 exercises that will provide you with the steps to realizing real answers and teach you to start asking the right questions. By learning how the mind works, you can understand how to break the cycles that keep you on the outside looking in, instead of where you truly want to be. Learn to ask yourself questions that will shift your energy and help you to achieve your goals. What you feel comes from what you think. Are you aware of thoughts that lead you to feel bad? © A.J. Mahari - March 2010 - All rights reserved.